I’ll be honest – Mallorca wasn’t high on my list of places to visit. But I gave it a chance and now I can’t shut up about how amazing it is! My decision to visit was based on simple math. How could I add sunshine to my life without subtracting too much money from my bank account? 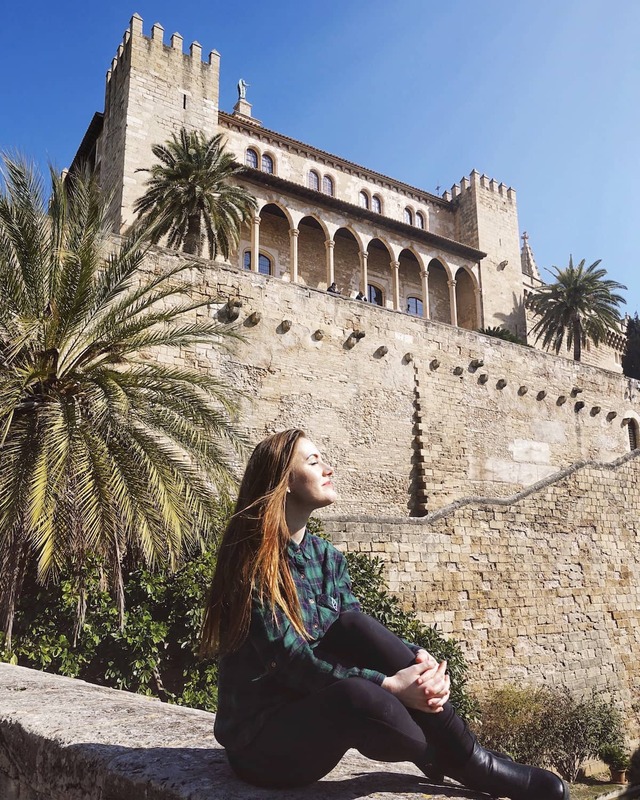 The flights to Mallorca from most of Europe are very cheap and this was especially true in February when I was planning my trip. So I packed my suitcase, said auf Wiedersehen to rainy Vienna and hoped for the best. After spending ten days on this lush Spanish island I came back a changed woman. It is so much more than the trashy holiday resorts I’d associated it with in my mind. I spent half the time hiking the Serra de Tramuntana mountain range and the rest staying in romantic agroturismos and hanging out in Palma. My boyfriend and I managed to see a lot of the island, including towns most visitors had never heard of. 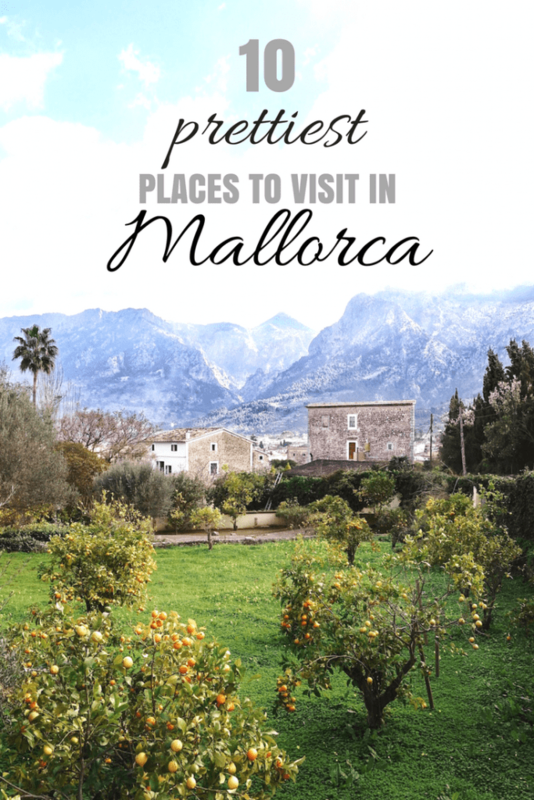 That’s why I’ve put together this list of the prettiest places to visit in Mallorca. I hope it gives you something new to do in this sunny paradise! How could you go to Mallorca without seeing the capital? You literally couldn’t as the island only has one international airport located just outside Palma. Nor should you though, because the city is an underrated gem full of history and more delicious local specialties than you can eat in a month. Not that I’m discouraging you from trying, I know I did and returned a few pounds heavier happier. Try planning your trip around one of the local festivals. I visited during the Sa Rua carnival and it was an incredible city-wide celebration. I’m talking hundreds of people in the streets wearing elaborate costumes and eating, drinking and dancing from dusk till dawn. Sa Rua isn’t even one of the island’s biggest festivals so I can only imagine what a proper Mallorcan street party looks like. 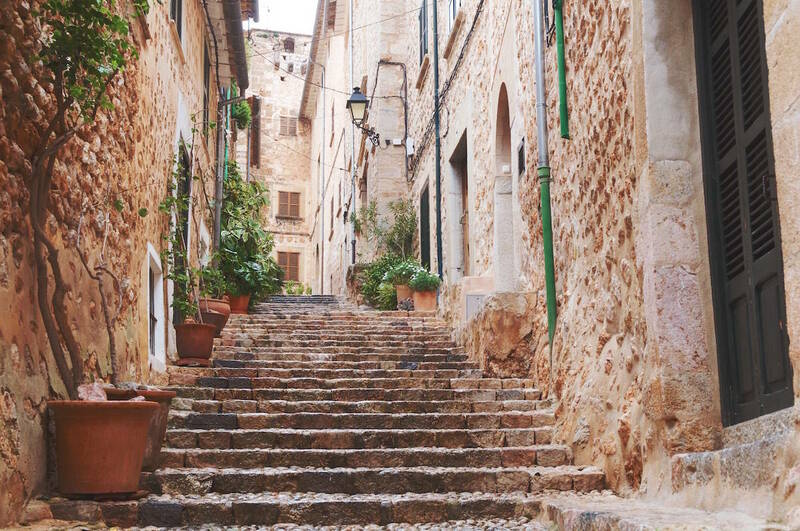 Deià with its windy narrow streets will take your breath away… and you won’t be the first. English poet Robert Graves fell in love with it too and is buried under a great cypress tree next to the village’s church. If you’d like to learn more about his life visit La Casa de Robert Graves, the perfect museum to explore on a lazy afternoon. “I found everything I wanted as a writer,” Graves wrote of Deià once, “the sun, sea, mountains, spring water, shady trees, no politics and a few civilised luxuries such as electric light and a bus service to Palma, the capital.” Although the town has changed dramatically since his time, with expensive restaurants and luxury hotels lining its only main street, there’s still a sense of calm in the air. The tiny town of Lluc is home to a 13th century monastery, the island’s spiritual heart. This pilgrimage that attracts visitors from all over the world and is one of Mallorca’s most popular tourist destinations. 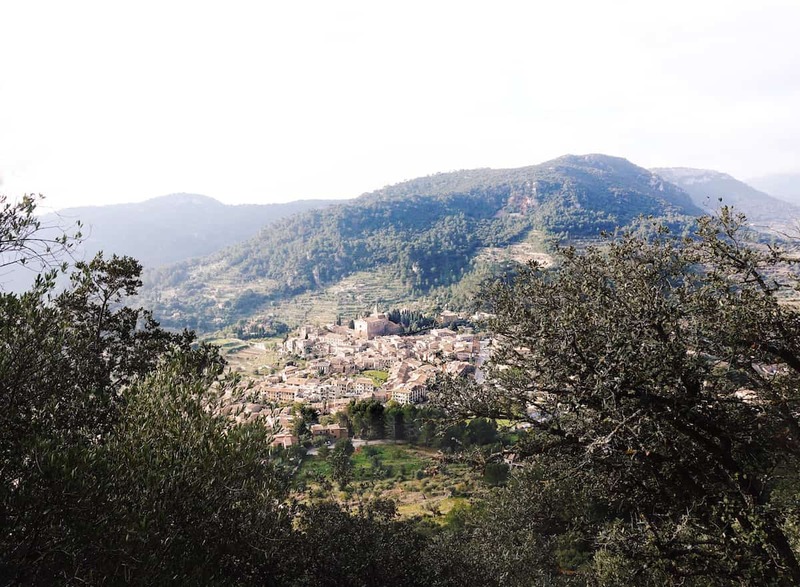 I travelled there the old school way by trekking dozens of kilometres across the Serra de Tramuntana mountain range, and while it was definitely worth it don’t forget you can just take the bus there. You can even spend the night inside the monastery, a rare opportunity I naturally had to investigate. The rooms have a distinct Mallorcan feel – all dark wood, crisp white bedding and gilded ceilings – but even more interesting are the views. My standard double room had a view of the courtyard which didn’t sound quite as appealing as looking out at the mountains, but as soon as I saw it I felt uncharacteristically tranquil. Don’t even get me started on the food! The Sa Fonda restaurant inside the monastery serves all kinds of local delicacies, although sadly for me few were vegetarian. But it’s well worth a visit just for its imposing marble columns. Restaurant Ca s’Amitger just outside the sanctuary’s grounds offers more plant-based options, with my favourite being the sopa mallorquina (bread and cabbage stew) and tumbet (local version of ratatouille). 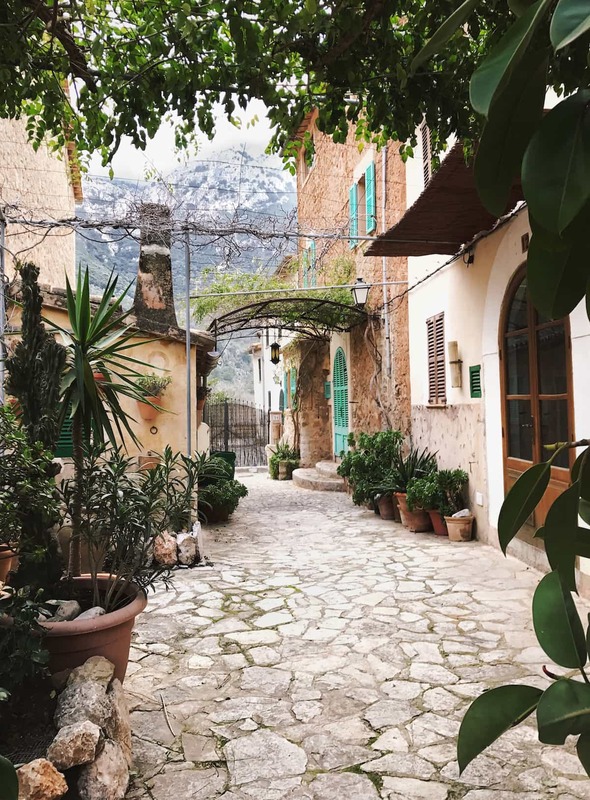 Sóller boasts one of the prettiest town squares in Mallorca. 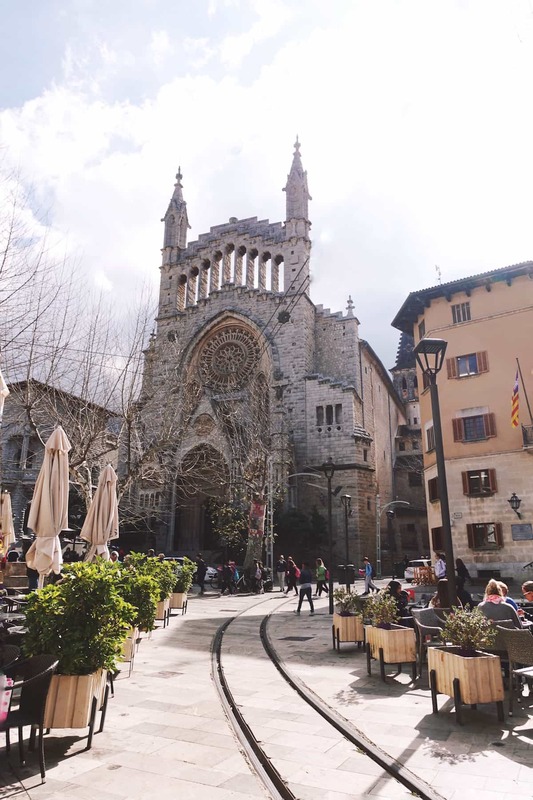 You can sit right in its centre, enjoying a large plate tapas while overlooking the Sant Bartomeu church. Every now and then, a bright orange tramway drives past making you feel like you’ve travelled back in time. The town is surrounded by valleys of citrus groves and you shouldn’t leave without trying their freshly squeezed orange juice or the Angel d’Or liqueur invented by local farmer Miguel Capó. The famous tramway I just mentioned, the Tranvía de Sóller, links the town to Port de Sóller. You can just hop inside one of its original cars from 1913 and enjoy the wind in your hair as you cut through the leafy orchards that stand between them. In Port de Sóller you will find sandy beaches, seaside restaurants and two lighthouses. The picturesque resort is a far cry from the craziness of Magaluf in the south of the island, attracting a slightly older and more affluent crowd. Don’t forget to visit Io Gelats Artesans for a scoop of delicious home-made ice cream, with innovative flavours like mascarpone and fig or chocolate and blood orange. 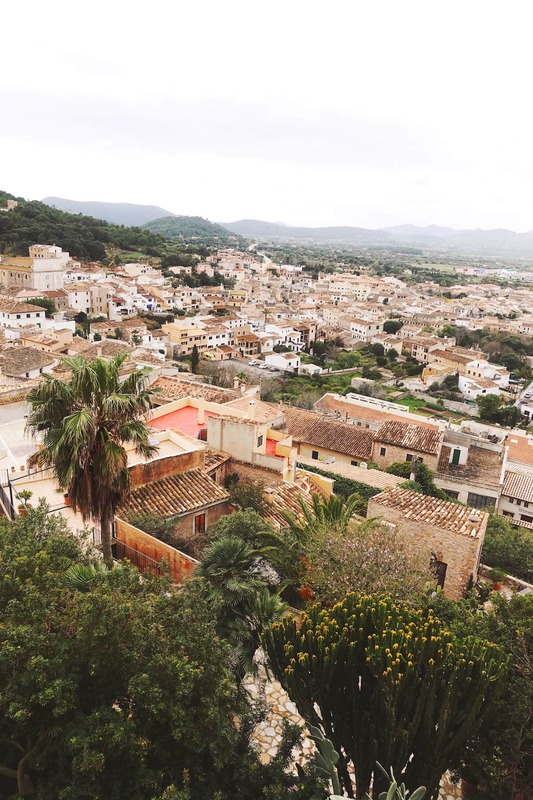 This scenic town in the north of Mallorca is full of history, from the Pont Roma – an ancient Roman bridge which is still in use – to Puig de Pollença, a small mountaintop monastery just outside the town. 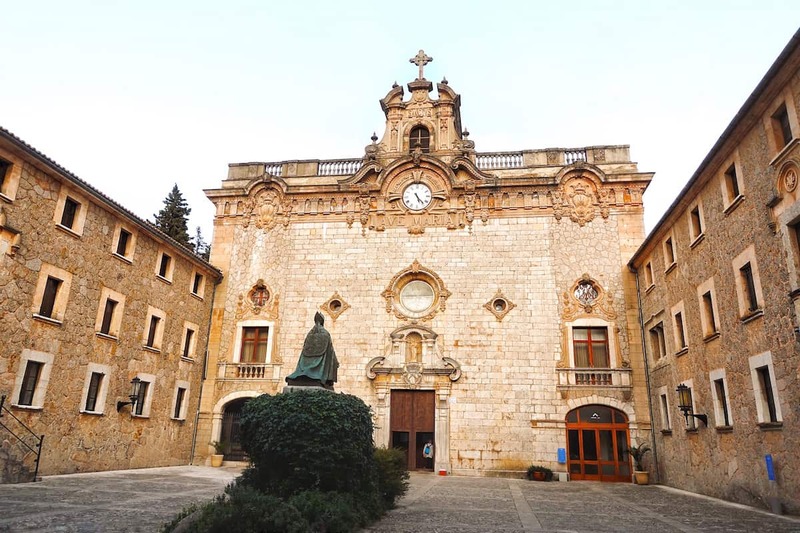 To add a spiritual twist to your trip visit Sancturi del Puig de Maria. Although it’s overshadowed by the popular Lluc monastery, it’s actually the oldest one on the island. It was abandoned in 1576 but today the hermitage offers basic accommodation in converted nuns’ cells and traditional Mallorcan fare. 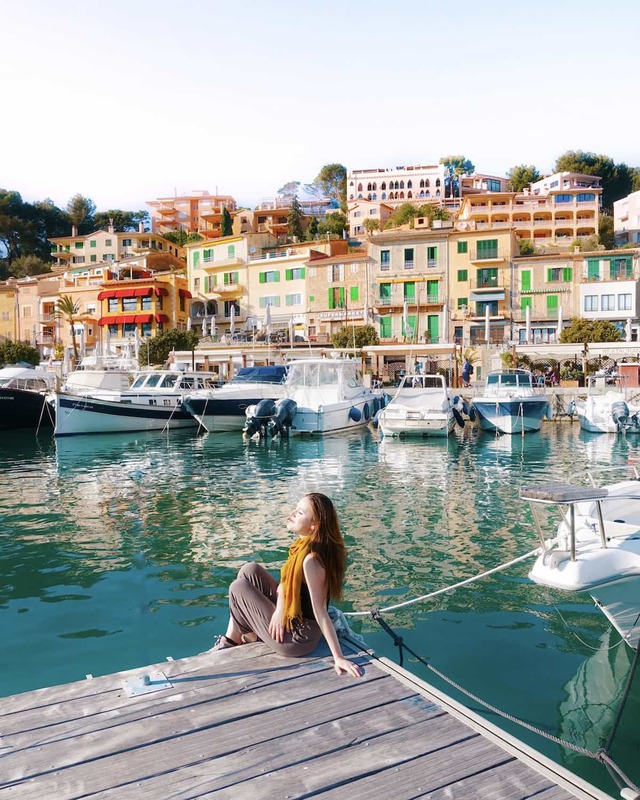 If you’d rather just lay on the beach and enjoy the sunshine check out the nearby town of Port de Pollença. You could join the crowds there or you could drive a little further and find Cala Sant Vicenç. This natural cove is the perfect place to escape the other tourists and enjoy some delicious local food. The Far de Formentor is an active lighthouse and a favourite among photographers travelling to Mallorca. 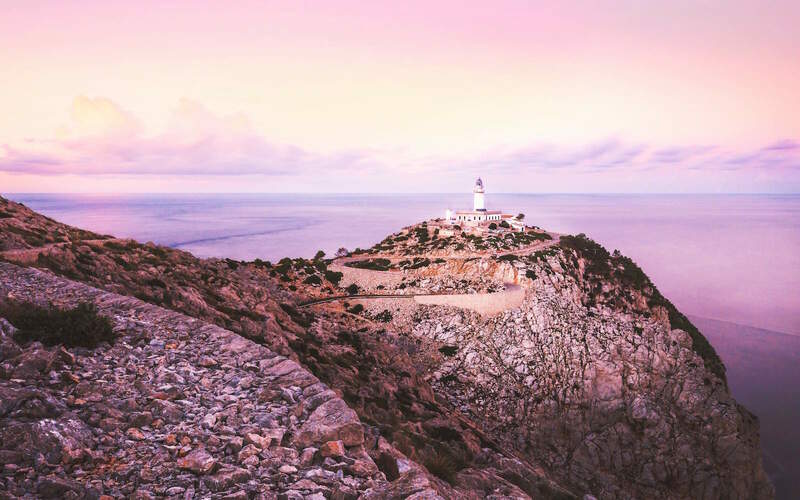 As the highest lighthouse in the Balearic Islands it offers some pretty incredible views and it is the place to watch the sunset! The best way to get there is by car, setting out from Port de Pollença and really enjoying the picturesque 20 kilometre (12.4 mile) journey. You’ll be navigating your way through twisty hair pin corners and along tall cliffs so I’d only recommend this trip to experienced drivers. Fornalutx was recently voted one of the prettiest villages in all of Spain, which is no easy feat if you ask me. But it’s not exactly unexpected – the town has been receiving awards for conservation since the 1980s. Its narrow streets and general rustic charm attract thousands of visitors every year, but not all of them are content with a short leisurely stroll. Fornalutx’s location near the GR221 route along the Serra de Tramuntana makes it a popular hangout spot for hikers and mountain bikers so expect tight jerseys galore. 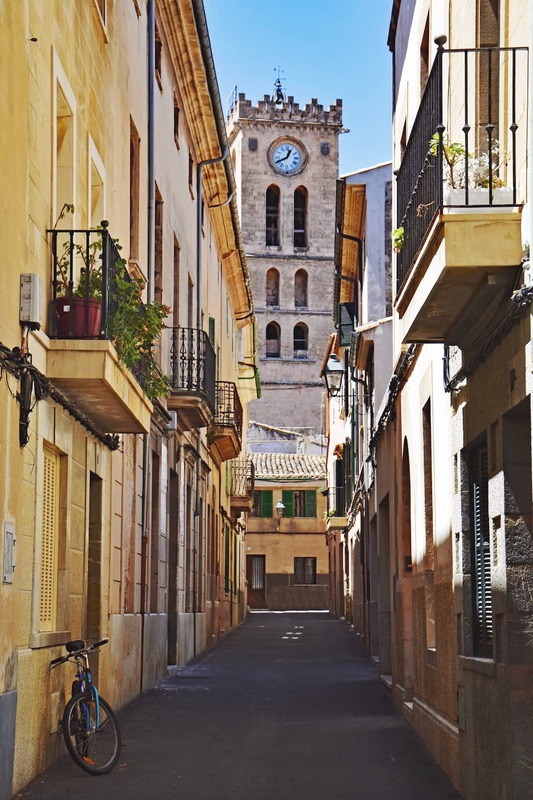 The quaint village of Valldemossa was once described by Frédéric Chopin as the most beautiful place in the world. That’s right – it received the 19th century equivalent of a five star TripAdvisor review from a renowned composer. I’d recommend getting there early and having a leisurely start to your day. Enjoy a coffee and a coca de patata, a sweet doughy pastry the village is famous for. If you’re visiting on a Sunday don’t miss the town market where you can find more local delicacies as well as charming antiques. 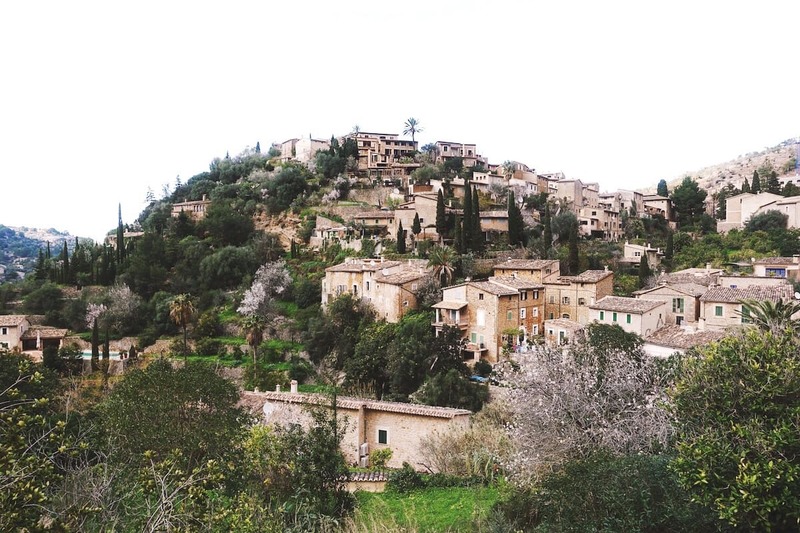 Few people who visit Mallorca have heard of Capdepera but it’s a real shame – this village on the northeastern side has fascinating stories written into every stone wall. The eponymous Capdepera Castle is a 14th century fortress that once protected its inhabitants from frequent pirate attacks. It was also the site of one of the sneakiest military victories I’ve ever heard of. After conquering Mallorca, King Jaume I of Aragon wanted to invade the neighbouring island of Minorca as well but needed his forces ready for the upcoming conquest of Valencia. Luckily, he had an idea. “We called all of our people and ordered lighting fires in more than three hundred locations in the bush here and there to give the impression that a whole army encamped there,” he wrote. The Saracens fell for the trick and agreed to sign the Treaty of Capdepera in June 1231, obligating them to pay the Aragonese king a tribute in exchange for remaining under their local Muslim rule. The Treaty of Capdepera is considered the oldest peace treaty that is still maintained. The original is kept in the National Library of France in Paris, but you can learn a lot about the town’s history within the castle’s walls. Pssst! If you’re looking for a beautiful place to stay in the area, check out my review of Cases de Son Barbassa. This romantic agroturismo overlooks the town of Capdepera and is one of the most beautiful eco-friendly hotels I’ve ever had the pleasure of visiting. 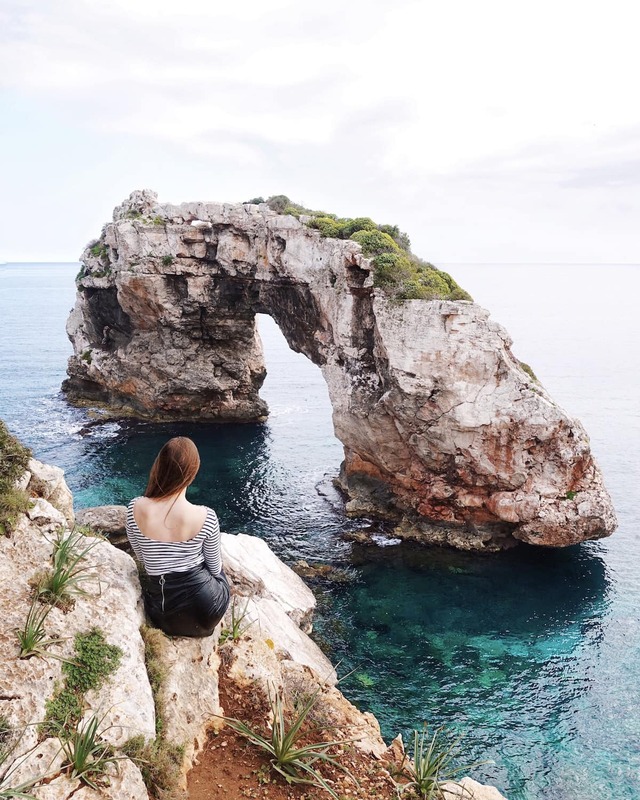 What are the prettiest places to visit in Mallorca according to you? Have you been to any of these beautiful towns? PS: If you’d like to make my day please vote for me in Flight Centre’s Travel Blog Awards 2017! I was nominated as the Best Travel Instagrammer – my account is @girlvsglobe – and I’d really appreciate your support! I’ve never thought of going to Mallorca either, but these pictures look amazing! Love Palma de Mallorca for it’s great shopping and delicious seafood restaurants. Also agree on Valldemossa and it’s tiny port! Haven’t been to Soller or Deia so I need to go back soon 🙂 Looks like Mallorca is even pretty in February as well! Thanks for the nice photos! When I was little I went to Mallorca a few times with my parents but I do not think we saw any of these places…such a shame LOL. I’ll admit, I share some of your original preconceptions about Mallorca. This is a great reminder to keep an open mind – wonderful round up of beautiful and historic spots! Despite the fact that Mallorca is super accessible from UK and I’m PRETTY sure I went with my parents as a toddler, I didn’t know much about it at all! SO pretty. Mallorca is such a beautiful island. I love your pictures. Formentor Lighthouse is my favourite.